Mechanical Face Seals are specifically engineered for rotating applications in extremely arduous environments where they withstand severe wear and prevent ingress of harsh and abrasive external media. A Mechanical Face Seal is also known as Heavy Duty Seal, Face Seal, Lifetime Seal, Floating Seal, Duo Cone Seal, Toric Seal , Mechanische Laufwerkdichtungen (German), Механични Челни Уплътнения (Bulgarian), 机械端面密封件 (Chinese), Mekaniske aksialtætninger(Danish), Mekaaninen otsatiiviste (Finnish), Joints d'Etanchéité Axiaux (French),Mechaniczne Uszczelnienie Czołowe (Polish), Juntas espejo (Spanish), Mekaniska Glidringstätningar (Swedish). 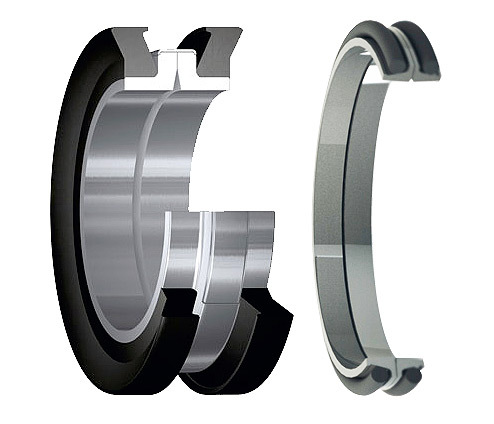 There are two different types of Mechanical Face Seals / Heavy Duty Seals.